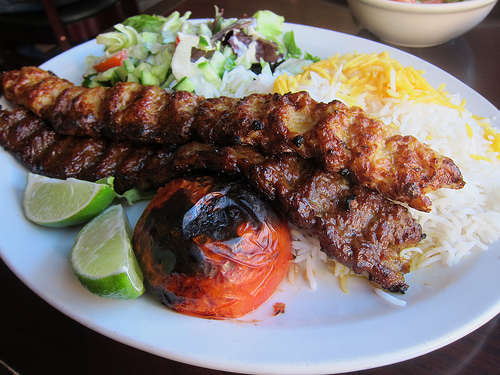 There are quite a few Persian restaurants in Los Angeles and a number of them are in Downtown Los Angeles. I’ve been to Shekarchi a few years ago. It was extremely busy then and still fairly humming along last week when I visited for lunch. Although we were initially attracted to the lunch specials, I felt I needed a lot of carbs after my bar crawl the evening before. And because I like variety, I chose the ground chicken and ground beef kabobs combo. I did get it with half salad and half rice though. I didn’t need that much rice. When you sit down, you are treated to some warm flat bread and icy cold butter. I decided to hide the butter under my bread for a while to warm it up. That gave me a chance to eat some of the wonderful tomato and cucumber salad they brought to the table. It was a really great dressing with spice I couldn’t identify. I probably should have asked about it but our enormous plates hit the table. My friend usually gets chicken but for some reason she got only beef that day. I insisted she had to try some of my chicken. It was incredibly tender and had a bouncy mouth feel. Anyone who has ever had an Asian fish ball will know what I mean. It was definitely my favorite over the beef. Not that it was bad but I might have to go all chicken next time. Well, let’s not get that crazy. I also liked how the kabobs were served with limes which gave a dose of fresh citrus to the meal. No scurvy for us! I might have to fold this into my lunch rotation from now on as it’s not far from the food-forsaken land near my office. And funny enough, this sit-down restaurant was much faster than the fast-casual kabob place also nearby. I’m now certainly in the mood for my Meat on a Stick crawl. Join us this Sunday!